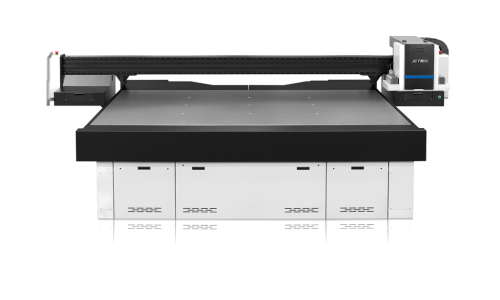 Faster than previous models, InkTec’s Jetrix LX18 production printer has a 3.2 x 2mwide flatbed, a powerful zonal vacuum system with automated pin registration for quick and accurate media placement. InkTec’s Jetrix LXi8 not only prints substantially faster than previous models, but it’s also more energy efficient too. Even though print speeds can reach 206m2/h in production mode, the innovative LED curing system reduces operational costs by delivering an overall lower energy consumption. With longer lasting LED lamps that require less heat, the LXi8 was designed for better green credentials, while the many automated features and safety systems make it even more user-friendly than ever. 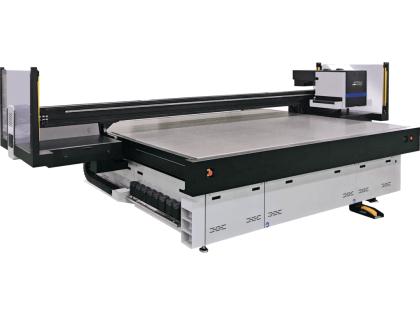 Fitted with the latest generation of Konica Minolta printheads, the LXi8 produces photorealistic printing through high resolution and variable dot, even at the highest speeds. The results, across a wide range of media, are always outstanding. Our UV inks feature multiple benefits for both outdoor and indoor printing applications. UV resistance, high colour concentration and excellent adhesion contribute to brilliant colour printing on both coated and uncoated media, including flex, PVC, vinyl, ACM, acrylic, glass and foam PVC. Additionally, spot or flood varnish can be used to add impact, primer can be used to prepare substrates such as metal and glass, and white ink can be added for transparent or coloured materials.